There are a 165 million in Andalucía. Olive trees that is. Yes, apart from tourism, it’s Andalucía’s biggest form of income. Vast areas of this autonomous region of Spain are covered in olive trees, often very neatly aligned on the hillsides. Many of our guests, here at our rural Bed and Breakfast in Córdoba show a huge interest in the trade, which forms part of the inspiration for this piece. As I write this, there is the sound of the olive harvest all around. There are two distinct periods for picking olives, one is called “el verdeo” and tends to take place October and November. As the name indicates, this concerns the green (unripe) olives; these are used entirely as table olives, i.e. for eating. Most of the green olives harvested come from the area west of here, Villanueva de Algaidas, Alameda and Mollina areas. The two main reasons for this are the terrain and the weather conditions. The area is much flatter and more prone to freezing, so many olives are harvested early to avoid them getting frozen. A frozen olive provides low quality oil and generates a much lower price per kilo than normal. 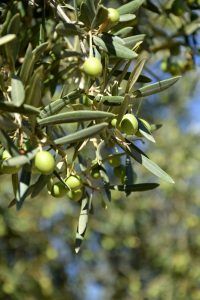 The main harvest period, when the olives have ripened and turned black, starts late November and carries on well into the New Year, generally until April (sometimes later depending on the weather conditions). The area around Cortijo La Haza has two main varieties, the Picual (also called the Marteño, after the village of Martos, in Jaén province) and the Hojiblanca. There appears to be a tendency to plant more Picual in the area, because they provide a heavier crop and have a higher oil content, but the Hojiblanca variety is a lot more resistant to drought and pests, so it remains a good choice. The details of how many kilos a tree produces are a bit sketchy (they would rather not say), but a 100kg per tree harvest is pretty good and the above varieties produce roughly 25L and 18L of oil respectively. That just leaves the how of the harvest, and that is quite another story. Time constraint is the most important factor when picking olives. Once harvested, they start to become more acidic, which affects the quality of the oil, and, by consequence, the price per kilo. To give an example, the qualities of Virgen Extra and Virgen oil must have less acidity than 0.8 or 2.0 respectively. All other oils are classed as “lampantes”, which literally means oil for lamps. Most olives tend to be processed within hours of picking, generally within 24h. In the olden days, harvesting would be done with large poles, up to 4m long. These would be used to whack the branches (causing a lot of damage to the tree) so the olives would drop into nets spread out under the tree. Today, this practice is still in use, but most people use mechanised means such as petrol-powered trimmers with a v-shaped, vibrating extension which is then placed around a larger branch. No matter how the “liquid gold” is harvested, rest assured it is back-breaking work, long hours on uneven surfaces often in very cold weather. Respect to the workers. Once the olives go to the mill for processing will be the subject of another post, to be published soon.